While health officials in Dallas scramble to contain a virus that could wipe out most of the US population, and insurance specialists such as, Andrea Martin, blast the POTUS’ Affordable Health Care Act for not covering Ebola, President Obama made a short speech in an attempt to reassure the nation that the unfolding pandemic is nothing to worry about, and Obamacare will be amended to include treatment for the fatal Ebola virus. 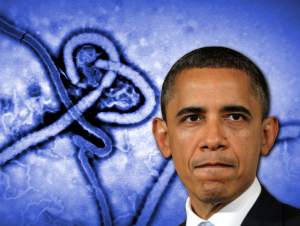 “America has faced larger, more menacing adversaries than the Ebola virus. We have worked together to defeat terrorism, and now we will work together to defeat Ebola. If our bodies become landscapes of a viral war, we will overcome as we always have.” Obama told the packed house at the Dallas, Texas Convention Center. 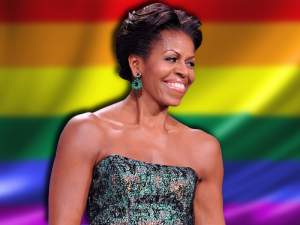 The First Lady will be making a candid announcement in next month’s issue of ‘OUT’ magazine; The cover of which Mrs. Obama will also adorn. Michelle Obama’s proclamations have left many speculating what the bombshell could be. Michelle Obama Claims Upcoming Interview With 'OUT' Magazine Will "Shock The World"
Eric Holder’s career has survived a long list of scandals; The 2008 Black Panther debacle, overturning Arizona’s immigration laws and ‘Fast and Furious‘ immediately spring to mind. These, however, pale in comparison to the recent allegations against Holder, the likes of which could easily land the Attorney General behind bars. Evidence has been uncovered showing Eric Holder contributed funds to Ferguson’s gang population as incentive to loot and spread civil unrest in the area. These angry, government-sponsored terrorists have systematically infiltrated peaceful protests with the intention of escalating the situation and inciting riots. Ferguson Gang Leader Admits "Eric Holder Paid Us To Start Riots"
Those who are unable to afford the steep Obamacare premiums are going to be faced with a lot more than just extensive fines at the end of every tax year. It has been reported that several Obamacare “labor camps” are being constructed around the nation where those who refuse or are unable to drum up the funds for the new insurance plans will be temporarily detained in order to work off fines. Sources say that an Amtrak railcar repair facility in Indiana was the first in the country to be converted into an Obamacare detainment and processing center. There have allegedly been multiple facility conversions in Arizona, Arkansas, Colorado and California. (USA) – As discord continues to brew among US citizens over the unsettled government shutdown, National Report has received word that the Obama administration has taken steps to prepare for an inevitable nationwide catastrophe. Several thousand Russian troops have been deployed to the US to aid in imposing martial law during the event that disharmony over the uncertain situation reaches fever pitch. As the shutdown trudges on with no clear end in sight, welfare recipients and other dependents living on the taxpayers dole grow progressively more anxious over the potential elimination of government aid programs and EBT cuts. Obama claims to be expecting a “worst-case scenario” and believes martial law will be needed to restore order to the masses. Obama reportedly made arrangements with Russian leader Vladimir Putin last month to employ Russian military as “back up” in the instance that American servicemen became overwhelmed with the uprising. (Washington, DC) – Obama’s DC stormtroopers once again barred entrance to the Washington Memorial as the US government continued to play hookey with our nation. Since Republicans decided to ‘take their ball and go home’ all federally owned buildings are closed to the general public. This, of course, includes the Washington Memorial. A massive turnout of elderly war veterans and aggro-protesters soon resulted in a violent confrontation with the democratic gestapo stationed outside. According to White House rumors, President Obama shut down all national memorials both to punish Republicans and to demonstrate the power he continues to lord over our nation. Outside of the Washington Memorial stood several hundred people, all demanding entrance into the beloved monument to their fallen heroes. “This is America!” Shouted one white-bearded gentleman hoisting a POW flag above his head. “I fought for this country! My friends died for this country! I should be able to pay my respects!”. Stone-faced police officers stood with M-16s slung over their shoulder and dressed head to toe in military garb. They glared through the angry mob, unflinching to their verbal abuse.